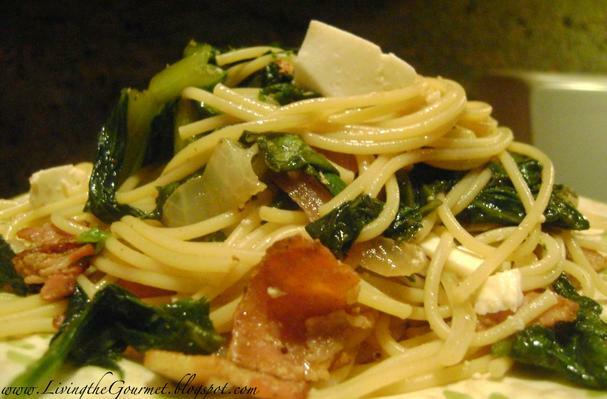 Foodista | Recipes, Cooking Tips, and Food News | “Salad” ~ Spaghetti! Prepare the bacon on a griddle and set aside. Heat a large frying pan with a few drizzles of olive oil. Add the garlic, red onion and a few dashes of red pepper flakes. Let the garlic get slightly golden and let the onion soften. Add the Romaine lettuce. Be Careful! If the Romaine is wet the oil will splatter, so gently add the Romaine and let it cook down. Do not let it become mushy! Let it remain slightly crisp. Prepare the spaghetti as directed, drain and add to the frying pan with the Romaine and toss. Prepare the dressing. Add the dressing and the Ricotta Salada cheese to the spaghetti and toss. This dish is easy to prepare and is delicious and unique to serve with a nice crusty piece of Italian bread.